The CIRCLE N SQUARE dance club of Yreka, First formed in the spring and summer of 1952, when a small group of people got together, struggling to learn square dancing from records. They soon wanted to learn more and hired Mr. Allen Howard of Medford, Oregon to instruct them and be their caller. From there the group grew, they formed a club and elected officers, due to lack of secretary records the first officers are not known for sure. In 1953 the group decided they needed a name and called their group “CIRCLE N SQUARE” dance club of Yreka, California. This same year they held their first Jamboree, where this was held and who did the calling, are not known. As the club grew they danced in various halls, some of them being, the IOOF Hall, Humbug Community Hall, Grange Hall, Hawkinsville Hall, American Legion Hall, and the Jackson Street School. The club callers through the years have been Allen Howard, Doug Fosbury, Chick Harrison, Art Schuck, Floyd Workman, Art Gravelle, Dave Abbott, Gene Arnold and Larry Wilson. 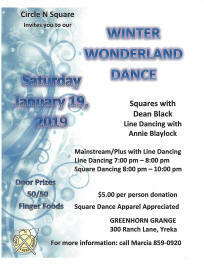 January 19, 2019 Saturday - Circle N Square - Winter Wonderland Dance, (M/S and Plus with Line Dancing) Caller: Dean Black, Line Dancing: Annie Blaylock, Greenhorn Grange, 300 Ranch Lane, Yreka, Ca. Show Map Line Dancing: 7:00 pm - 8:00 pm and Square Dancing: 8:00 pm - 10:00 pm. Square Dance apparel appreciated, $5.00 per person donation, door prizes, 50/50 and finger foods. For more information see Flyer below or left click for a printable PDF Flyer you may also call Marcia Eblen 530-859-0920. 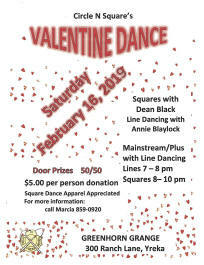 February 16, 2019 Saturday - Circle N Square - Valentine's Dance, (M/S and Plus with Line Dancing) Caller: Dean Black, Line Dancing: Annie Blaylock, Greenhorn Grange, 300 Ranch Lane, Yreka, Ca. Show Map Line Dancing: 7:00 pm - 8:00 pm and Square Dancing: 8:00 pm - 10:00 pm. Square Dance apparel appreciated, door prizes, and 50/50, $5.00 per person donation. For more information see Flyer below or left click for a printable PDF Flyer you may also call Marcia Eblen 530-859-0920. We now dance every Monday night and the 3rd Saturday night is Party Dance Night.